WALTER BENJAMIN COBB was born 8 Sept. 1920* at Grays, KY. He enlisted in the Navy on 17 Nov. 1937, giving the Navy a birth date of 8 Sept. 1919 so that he could join without his parents consent. After surviving Pearl Harbor, Walter was assigned to the destroyer MUGFORD (DD-389). He served in the crew of the #4 five-inch mount. On 7 August 1942, MUGFORD screened transports unloading troops off Guadalcanal on the first day of the landings. Four Vals dove toward the MUGFORD, dropping their bombs. The destroyer splashed 2 Vals, & a direct hit aft blew four men overboard, including Walter, who was uninjured. 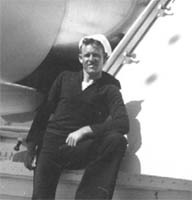 After RALPH TALBOT (DD-890) picked up the 4 displaced sailors, Walter volunteered to join the crew of that destroyer's #4 gun. In the pre-dawn darkness of 9 August 1942, the RALPH TALBOT was hit by a Japanese barrage, one of which hit the #4 gun mount, killing Walter. For his gallantry, WALTER B. COBB was awarded the SILVER STAR. A ship, the USS WALTER B. COBB, was later christened in his name. *Date of birth confirmed through family records.